I make cookies often and blog about them on my cookie blog, but this cookie has to be here and I have to say it is one of my favourites. Cinnamon and brown sugar for sprinkling on top of the dough before cooking. Line baking sheets with parchment paper. 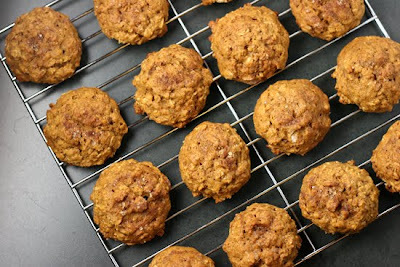 Combine flour, oats, baking soda, cinnamon, pumpkin pie spice and salt in a bowl. Cream butter, honey and sugars in large mixer bowl until light and fluffy about three minutes. Add pumpkin, egg and vanilla - mix well. Add dry ingredients and mix until just combined. Do not over mix. Chill dough for 30 minutes. Drop the cookie dough onto baking sheets with a tables`poonspoon. Bake for fourteen minutes. Cool on baking sheets for a couple minutes and then transfer to wire cooling rack. Oh my goodness! Who could resist those cookies? The ingredients just sounds like it would come together in the most wonderful mouth experience. Thanks! Gotta print this one out.